Mining is in general the removal of valuable commodities from the earth. These may be coal, stone, minerals (such as salt or lime) or the ores of metals such as iron and copper. As well as these, one can mine for diamonds and other precious stones. Whatever the material, a series of basic steps are followed in extracting the valuable part of the commodity whether it is coal for fuel, plumbago for pencil leads or diamonds for jewellery - all of which, by the way, are predominantly made of carbon. At Alderley Edge, the main products were copper and lead with, later, cobalt. However, the process of winning these from the ground shares much with mines anywhere in the world in the past and the present. A series of steps are normally required before the finished product is obtained and these are described here and on subsequent pages under this heading. Before the product can be obtained, it has to be found and this phase is normally referred to as exploration. Exploration can take several forms. In the early days of mining, it was probably chance recognition of a distinctive coloured streak of ore, such as Engine Vein may have appeared on the surface in the Bronze Age. 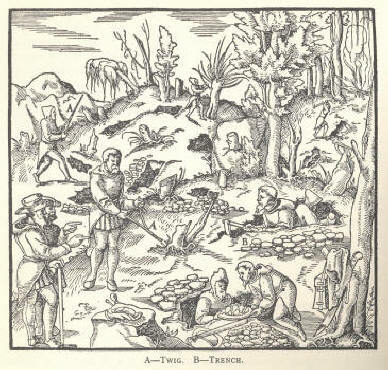 As time went on, other techniques are tried and Agricola describes divining (see picture right) although he admits that he has never met a very rich diviner! Other methods used hunches or inspired guesses and the miner dug shafts or tunnels where he thought the ore may lie, again as shown in the picture. Later still, exploration was by sinking boreholes through the strata and there are examples of this at Alderley Edge from the 19th century. Modern techniques still use some of these methods but have added: chemical analysis, gravimetric surveys, magnetometry, etc. to the armoury of the explorer. Once the ore has been found, there are several steps which might be taken in different orders. One is to obtain money to enable further development work to go ahead. This might be raised from adventurers, from the stock market, from the partners in the mine or from the profits of other ventures. Another step is to obtain permission from the landowner and mineral owner (who may be different people). This often entails investing in a lease and making undertakings to extract a certain amount of ore and carry out development work in a set period of time. Yet another step is to set up the infrastructure to enable mining to start. This might mean building roads or railways, setting up mine buildings, diverting rivers, and so on. Along with this, the mine developer will need a mine manager, probably one overall and one underground, experienced miners, labourers and surface workers with various skills. Then there may need to be engines and engine houses for pumping, a smithy to make and repair tools, barracks for the workers, an office and possibly a laboratory as at Alderley Edge. Now it is time to start digging (see left, Alderley Edge in 1911). The next phase might be described as development and entails making the ore body or rock accessible and providing routes to get it to the surface. Normally, this will involve either a shaft or an adit depending on the lie of the land and form of the ore-body. A vertical or deep ore body is best worked from shafts whereas a shallow or sloping one may lend itself to adit work. The first stage of development is complete when the ore body is reached and mining starts but development is never finished as the mine will constantly need to be extended or deepened to keep finding fresh product. Development also extends into providing the services that the mine needs. These are always going to include fresh air, adequate drainage and a means to remove the product. Air can be forced around the mine or may involve natural ventilation. Drainage which may need a pump to be set up or may be by natural routes into caves cut by the mining or via adits, known as soughs in some places, leading to a nearby valley. Haulage will involve use of the shafts that might have been driven for exploration although often larger shafts will be sunk (especially at coal mines) to allow efficient mineral extraction. The picture below shows a horse gin (or engine) working a shaft, an arrangement that might have been seen at Engine Vein in the early 19th century. There is more about these aspects on a separate page on this site covering services. Once the mine has been developed, extraction can get under way. Different techniques have been used over the centuries and this is well demonstrated at Alderley Edge. A description of the extraction methods is on a separate page. Extraction brings the ore to the surface where a new set of problems have to be solved. The first step is normally to concentrate the ore so as to remove unwanted material such as pieces of the host rock. This was carried out in the past by hand using hammers and hand-powered machinery but nowadays is a sophisticated process using buildings and plant known as mills. At Alderley, the first stage was simple as the host rock was soft and in the 19th century there was minimal concentration of ore required as the chemical process separated metal from waste very efficiently. In metalliferous mining, the concentrate is normally an oxide, sulphide, carbonate or similar form of the desired metal. The metal is then extracted by a range of processing techniques. The methods used at Alderley Edge are covered in more detail on the processing pages. 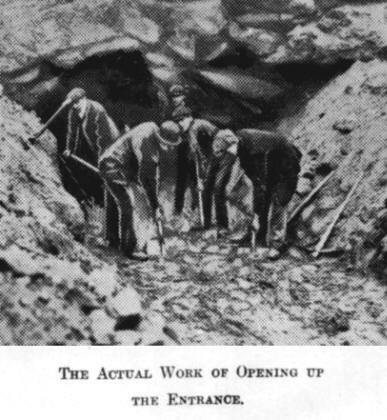 Some processing may be on site, such as roasting ores to remove sulphur, but the concentrate or crude product was often sent elsewhere to be refined, as was the case from Alderley Edge. Finally, the product is sold. This might be as an ore, a concentrate, an unrefined or a refined product. The miner then gets his money, pays his bills and his men and starts the cycle again: exploring, developing, extracting and processing.